Two girls from SOS Children's Village Mthatha enjoy hairdressing in their spare time and two boys are turning into talented artists. Queen (16) spent her school holidays and weekends hanging out in the local hair salon. "It was at the salon that I learnt how to do hair," she said. "I discovered when I tried it out on my siblings that I'm talented at doing it. I want to make use of it and learn from other people." Queen describes herself as business orientated and would like to have her own hairdressing salon one day. "I am a hard worker and I study hard," she said. She is in grade ten at Khanyisa High School and enjoys the subjects of economics, accounting and information technology. When Queen is not braiding the girls' hair in the village, she likes to play netball, volleyball and soccer. Nosibuselo (19) lives in the youth house at SOS Children's Village Mthatha. She is also interested in braiding hair and has even made some money from it. "I used to do my ten-year-old sister's hair and people liked what I did so I became interested in doing hair." Nosibuselo then began doing hair for people in the village and at the place where she spent her holidays in the rural area of Lugecueni. "People pay me R60 (8 USD) for long braids, R30 (4 USD) for short braids, R60 for a ponytail, and they bring their own fibre," she said proudly. "I have already bought a cell phone and clothes from the money I made." Nosibuselo is in grade ten at Khanyisa High School and says it is OK. She would like to become a hairdresser when she finishes school. 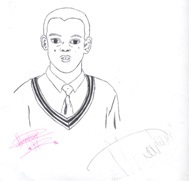 Khotatso (17) started drawing when he was at the Hermann Gmeiner Primary School in 1999. He continued to developed his artistic skills and his talent grew. "Mostly I draw for myself because I enjoy it and it keeps me occupied," he says. While Khotatso may only draw for entertainment and leisure, his talent has been noticed by the village and they have, on occasion, asked him to draw banners for special days such as HIV/AIDS day. "He drew the AIDS ribbon in a matter of minutes and it was beautiful," said an SOS co-worker. His high school, Khanyisa, also calls on Khotatso to help with school play scenery. He often gets full marks or at least 14 out of 15 for his art projects. Even though Khotatso seems talented in the art field, he says his best subject is mathematics and he would like to be a pilot one day. Zola (18), also goes to Khanyisa High School and is interested in art. "Art is something I like to do. When I had nothing to do I just drew, and I became good at it." Zola says he would like to do something in the field of drawing when he finishes school.